CPT Q025 – Why did the sinking cold rock not entrain hot material and warm dramatically as it sank? Question 25. CPT posits that cold material from near the earth’s surface at the beginning of the Flood (essentially at surface temperature) now rests at the bottom of the mantle just above the liquid core. Why would molten material not have intruded this cold rock as it descended and warmed it as it did so? And as the cold material “pancaked” at the bottom of the mantle, would its kinetic energy been converted into substantial thermal energy? Response: First of all, the mantle through which the cold material descends is solid, not molten. Although the surrounding mantle is solid, it nonetheless is considerably hotter and therefore weaker than the colder descending rock. So the stronger, denser sinking rock has the tendency simply to push the weaker rock out of its way as it makes its way to the bottom of the mantle. Slides 69-71 in the 2008_ICC_CPT_Talk, reproduced below, do a nice job in visualizing this sinking process and also the manner in which the sinking material deforms as it makes its way to the bottom. These slides show very little entrainment of the surrounding hot material. Neither is there any significant deformational heating, because the surrounding rock is weak. In regard to the amount of heating resulting from the dissipation of kinetic energy as the slab interacts with the base of the mantle, even though the descent of this material is extremely fast by uniformitarian standards, in absolute terms the speed is only on the order of a meter per second (about 2.2 miles/hour) as the cold blob encounters the base of the mantle. Therefore its kinetic energy is essentially negligible as far as its being able to increase the rock temperature in any significant way. At 2 m/s, its specific kinetic energy (equal to 0.5 u2, where u is the speed) is 2 J/kg. By contrast, the specific heat for mantle rock is about 1000 J/kg-K. So the temperature increase resulting from the kinetic energy being converted to heat is only 2 J/kg/(1000 J/kg-K) = 0.002 K.
CPT Q024 – Did the continents separate only once or more than once during the Flood? Question 24. 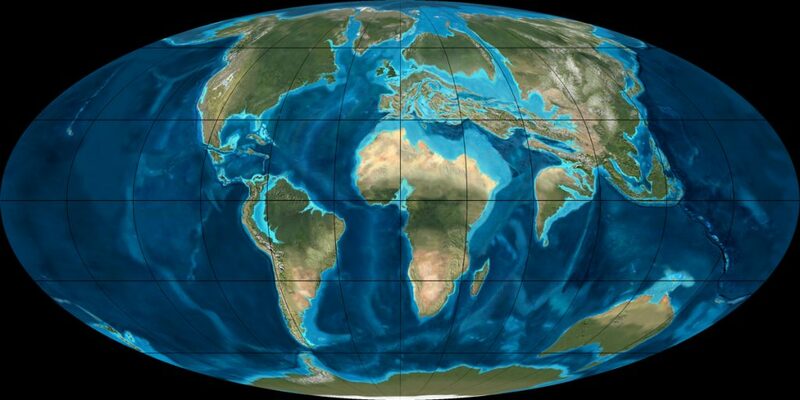 Did the continents separate only once or more than once? Were the water jets at the mid-ocean ridge something that only happened once at the beginning of the Flood? 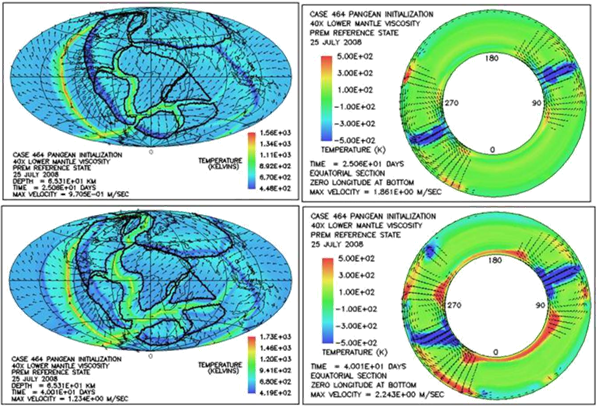 Does your model assume that the subducting plates all started their movement at the same time? Is there evidence to support this? 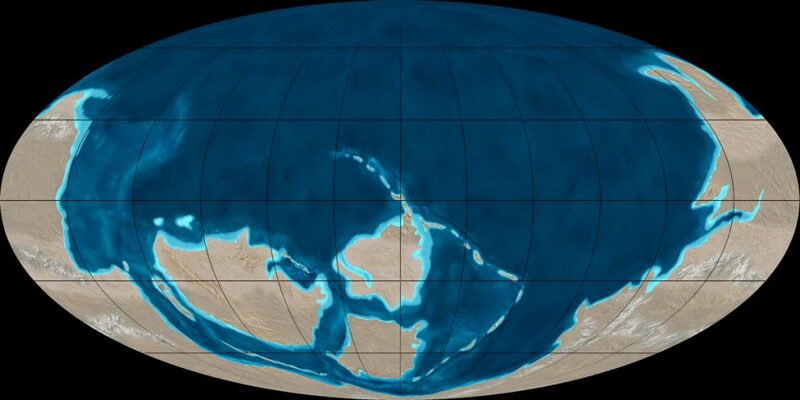 Response: How many times the continents experienced separation depends on which portion of the original supercontinent configuration one considers. 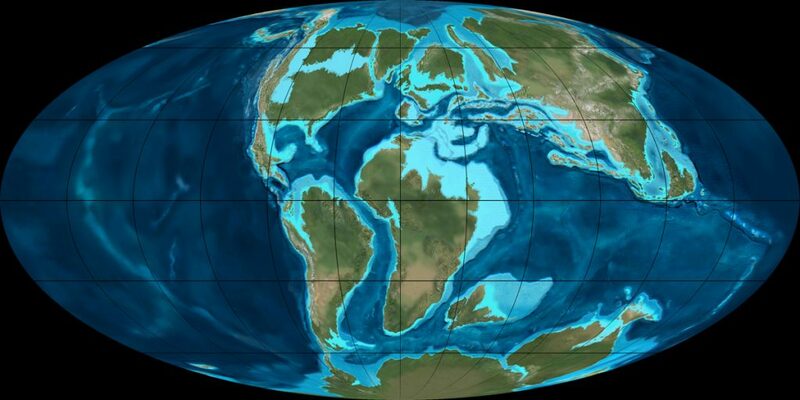 The available evidence seems to indicate strongly that Gondwana portion—involving present-day South America, Africa, Antarctica, India, and Australia—remained intact from the beginning of the Flood cataclysm through the entire part of the geological record known as the Paleozoic and then experienced a single breakup during Mesozoic part of earth history. 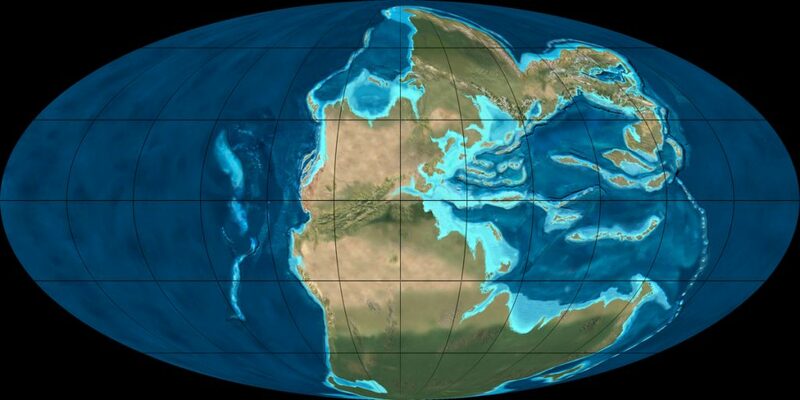 By contrast, the evidence also strongly suggests that the rest of today’s continents, that is, North America and Eurasia, while apparently joined to Gondwana at the very beginning of the Flood to form a giant supercontinent known as Pannotia, soon afterward broke away from Gondwana as the three separate blocks of Laurentia, Baltica, and Siberia. 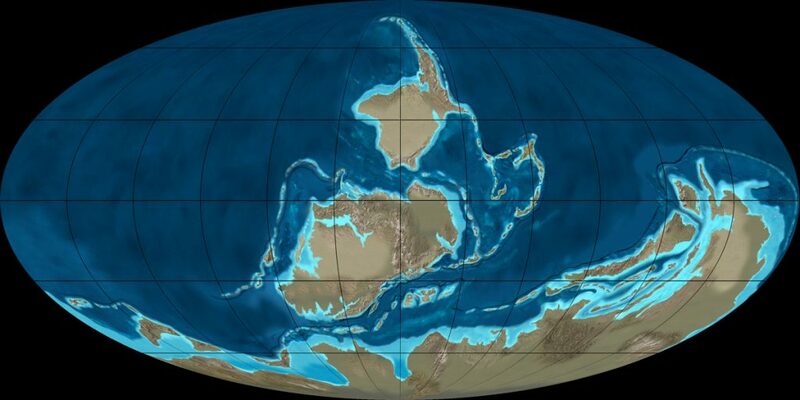 During the middle and later parts of the Paleozoic, these three blocks came together again and rejoined Gondwana to form the supercontinent Pangea, which then split apart during the Mesozoic. Therefore, the northern continents have experienced two separations. The following images provide one of the best visualizations in my opinion of this history of the continental motions from the time of Pannotia to the present. The images can be freely downloaded from the web here. This is the website of Ron Blakey, emeritus professor of geology at Northern Arizona University. The following twelve images (out of a total of 27 available on the website) depict this history of continental movement. These images by Blakey agree closely with the reconstructions produced by Chris Scotese over the past twenty years as part of the Paleomap Project. These reconstructions are viewed favorably by most of the secular earth science community. The website for the Paleomap Project is http://www.scotese.com. 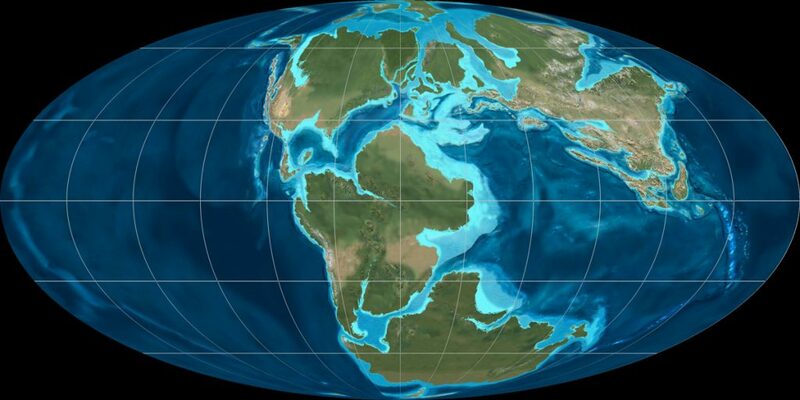 The reliability of these reconstructions in my opinion is reasonably good from the middle Mesozoic (i.e., Jurassic) to the present, mainly because of the constraints provided by features such as fracture zones in today’s ocean floor. 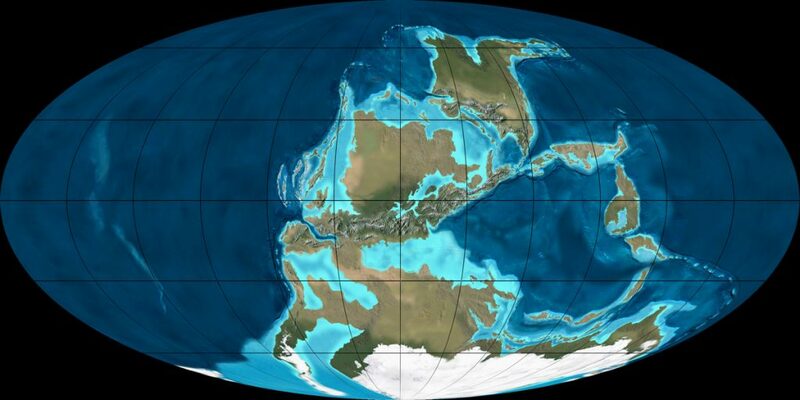 However, for the history earlier than Mesozoic, no seafloor still remains at the earth’s surface. Therefore, the reconstructions must rely on clues from continental rocks, such as the presence of earlier mountain belts, other evidences of earlier tectonic deformations, and paleomagnetic directions locked into igneous rocks and certain sediments. I personally consider the tectonic indicators much more reliable than the paleomagnetic ones. I therefore consider the motions of the continental blocks relative to one another as reasonably reliable for this earlier portion of earth history, as opposed to the absolute locations, because the relative motions rely more on the geological field observations and less on the paleomagnetic interpretations. The numbers in parentheses in the captions of the figures below represent the uniformitarian age in millions of years. Of course, my conviction is that all the change that unfolded in this sequence, except for a little between the final two frames, occurred within the span of the year of the Flood as described in Genesis 7-8. 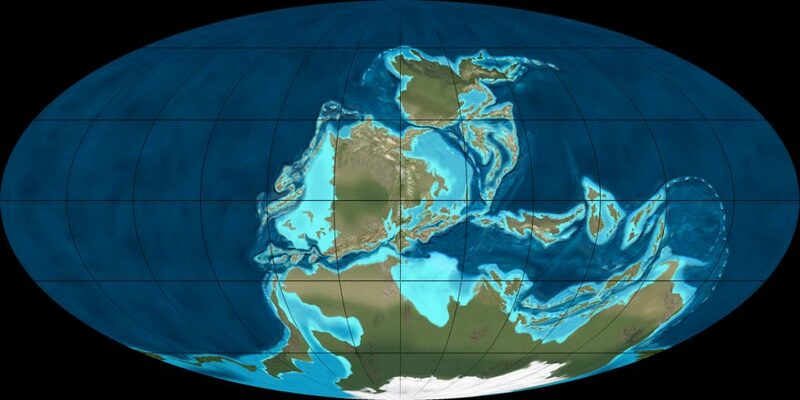 Note that one prominent aspect of these reconstructions is that the Pannotia supercontinent at the beginning of the sequence is centered approximately at the earth’s South Pole, while the supercontinent Pangea that is in place at the beginning of the Mesozoic is centered approximately on the equator. It was in 2006, while I was grappling with just how such a 90° of true polar wander might occur within the short time scale of the Flood for all the continental regions, that I discovered the potential for rotational instability. My own view now is that if such an episode of rotational instability did in fact take place during the Flood, as I am now convinced it did, then the paleomagnetic data that are used to locate Pannotia at the South Pole may simply reflect the fact that the extra rotation that occurred about the axis perpendicular to the spin axis took the supercontinent through the South Pole location multiple times and gave rise to the particular paleomagnetic alignments that are being relied upon. Therefore, my present suspicion is that at the onset of the Flood, Pannotia’s center was near to the equator, and that the placement of the continental blocks within it was strikingly similar to the distribution of blocks which characterized Pangea. 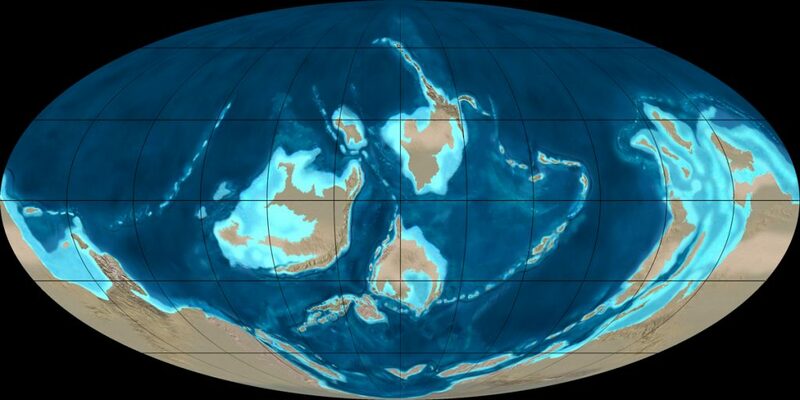 In particular, the Gondwanaland block would have been close to identical in its makeup, location, and orientation on the earth relative to its spin axis in both Pannotia and Pangea. If this suspicion is correct, then the continent distribution in figures (a) through (g) should actually be rotated counterclockwise such that the center of mass of the continents lies near the equator throughout the entire sequence. Also, if this suspicion is correct, none of the glaciation depicted for Pannotia or during Mississippian or Pennsylvanian times would have existed. Now let me address the issue of the timing of the steam jets at the mid-ocean ridges relative to this plate motion history. First let me emphasize that for plates to be able to move fast enough for these motions to occur during the time span given in Scripture, runaway motion within the mantle must be occurring to produce the stress-weakening required to reduce the viscosity throughout the mantle by many orders of magnitude. Otherwise mantle rock would display the sorts of viscosities it does today with the result that plate velocities would be on the order of only cm/yr instead of m/s. This leads me to infer that essentially all the plate motion history depicted in the figures above, at least through frame (j), occurred during the main runaway phase of the cataclysm. This main runaway phase would have been accompanied by very rapid seafloor spreading, a curtain of violent supersonic steam jets emerging from the zones of spreading, and consequent heavy rain resulting from water entrained by the jets. The time interval for this main runaway phase would therefore seem to correspond to the forty days and nights of heavy rain described in Genesis 7. What about the issue of whether all the subduction began at the same time? My guess is that the answer is no. First of all, let me point out that guessing the initial state for the mantle which is required to yield the sort of plate motion history described above is an extremely difficult, if not impossible, problem. 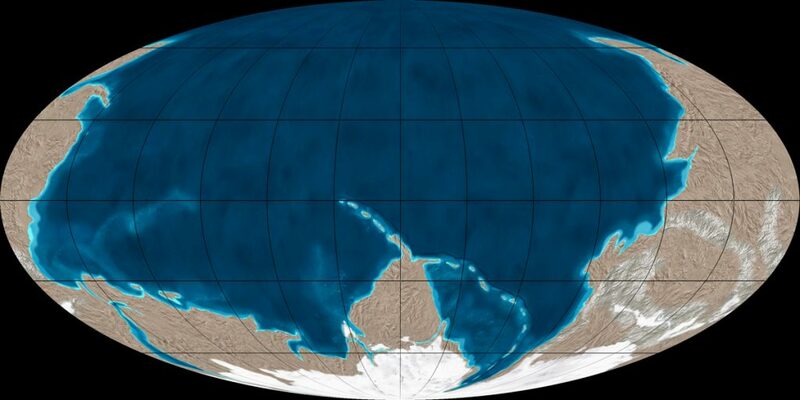 However, in papers I have presented over the years I have shown that a ring of cold material around much of the perimeter of a Pangean-like supercontinent can indeed lead to a subsequent post-Pangean plate motion history similar to that depicted in the above figures. In the model calculations new zones of rapid subduction grow and develop during the course of the calculation. But what about the Paleozoic or pre-Pangean plate motion history that is depicted in these reconstructions? It is my suspicion that the breakaway of the Laurentia, Baltica, and Siberia blocks from Pannotia was likely caused by a runaway upwelling plume of hot material from the bottom of the mantle similar to that observed on the right-hand edge of the 2D calculation that I discuss in the following question (Q24) (question 25). This first pulse of upwelling would then plausibly be followed by runaway sinking of a cold ring of material as I have included in earlier modeling. This sinking and the associated subduction, however, may have begun earlier in some places than in others. There is nothing in this overall picture that requires the cataclysm to be unfolding at full speed everywhere from the very beginning. Finally, let me take this opportunity to emphasize that CPT, both as a concept and as a model for the Flood, is grounded in the compelling observational evidence that seafloor spreading and subduction are real processes which not only are occurring today but have also occurred on a massive scale in the past to generate today’s ocean floor basement rocks. 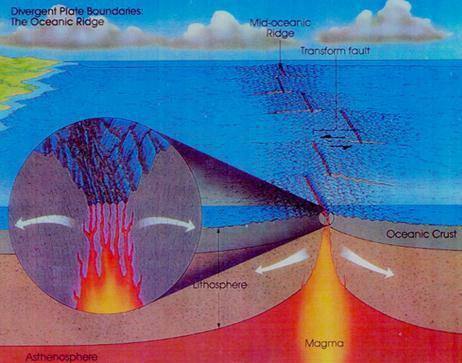 As a concept and Flood model, CPT in addition relies on many lines of observational evidence that a huge amount of subduction and seafloor spreading occurred simultaneous with the formation of the fossil-bearing sedimentary record and therefore logically must have played a major part in the cataclysm. Understood in these terms, CPT has nothing to do with computer models! Computer modeling is merely an auxiliary tool to gain deeper insight into the physics and processes involved. The validity of CPT therefore should be judged primarily on the strength and consistency of the observational data and how well this body of data agrees with the constraints of the Biblical text and not on the degree to which the processes can be simulated on a computer. CPT Q023 – Why is the mantle not stably stratified and hence resistant to any vertical flow of rock? Question 23. Why should density differences due to temperature differences even matter in the mantle when the density differences among the different minerals are so large by comparison? Would not the minerals rise and sink in accordance with their specific gravities during the 1650 pre-Flood years to establish a stable vertical density stratification which lithospheric slabs afterward would be incapable of penetrating? Response: The answer actually is quite simple. The rock material of the mantle is in the solid, not liquid, state, except for some extremely tiny pockets near the surface where some partial melting is taking place. Where the rock is solid, no density stratification can occur! Almost everywhere in the mantle, the ultramafic rock consists of an interlocking matrix of solid mineral grains. Moreover, the rock consists of a mixture of different mineral types. In the upper mantle above the transition zone, for example, the dominant mineral types are olivine and pyroxene, but there are commonly smaller amounts of several other minerals such as garnet. In the lower mantle, the dominant minerals are magnesiowuestite and silicate perovskite. As one goes deeper into the mantle, the mineral assemblages change because of the increasing pressure, but available observational evidence indicates that the bulk chemical composition remains very close to uniform. Even in the small volumes where partial melting is taking place, for example, just below spreading ridges and about 100 km deep just above the top side of a subducting plate, the rock is still, for the most part, a coherent solid of interlocking mineral grains. In these volumes, it is only the minerals with the very lowest melting points that are melting. The remainder of the crystals in the solid matrix are unmelted and solid. Typically, the degree of melting in these special places in the uppermost mantle is only on the order of a few percent. How do we know that the mantle is solid and that the rock is strong? The primary evidence comes from seismology. Waves of the type known as shear waves propagate throughout the entire mantle. From the shear wave speeds we observe, it is possible to determine the shear modulus of the rock material and to conclude that, on the time scale of seismic waves, the rock strength is comparable to that of high grade steel. By contrast, shear waves fail to propagate at all in the outer core, that is, in the region just below the mantle. From this we infer with a high level of certainty that the outer core is liquid. From its density and other characteristics, in view of high pressure/temperature measurements we can make in the laboratory, we can further infer that its composition is largely molten iron. Significant chemical contrast does exist, however, between the mantle and the crust. While the oceanic crust is basaltic in composition and derived from the partial melting of mantle rock, continental crust is radically different from mantle rock. Its density (about 2700-2800 kg/m3) is about 15-18% less than that of mantle rock (about 3300 kg/m3), and it tends to have dramatically higher concentrations of what are called incompatible elements. Such elements are referred to as incompatible because they do not conveniently fit into the lattices of most common rock-forming mantle minerals. These incompatible elements includes those with a large ionic radius, such as potassium, rubidium, cesium, strontium, and barium, as well as those with large ionic valences such as zirconium, niobium, hafnium, the rare earth elements, thorium, uranium and tantalum. Because of its high concentration of incompatible elements, continental crust typically displays at least 100 times the level of the main radioactive elements relative to rock from the mantle. In summary, why is the mantle not stably stratified according to mineral density? The basic answer seems to be that God created it nearly chemically homogeneous and solid. Being solid and nearly homogeneous, there is no significant tendency for denser minerals within a small local parcel of rock to sink relative to the others. CPT Q022 – Why would the rotational instability you posit for the Flood not begin just after creation? Question 22. Would a ring of cold material in the upper mantle sufficient to produce the rotational instability you talked about in your 2008 ICC presentation, if present from the earth’s creation, not cause rotational instability immediately from the beginning of history instead of waiting some 1650 years between Creation and the Flood? Response: Actually, it can be shown that, if there are no external torques or internal perturbations, the earth will spin indefinitely about its initial spin axis, even if an orthogonal axis has a larger moment of inertia. Indeed, in my numerical solution of Euler’s equations, starting with this sort of initial state, I must intentionally introduce a perturbation to trigger the rotationally unstable behavior. If I do not, the system continues happily forever in its initial state. CPT Q021 – Could an earth created on the verge of catastrophic runaway possibly be ‘very good’? Question 21. Would a ring of cold material in the earth’s upper mantle that was on the verge of catastrophic runaway, as you postulate, if part of God’s original construction of the earth, be consistent with God’s declaration at the end of creation Day 6 that all He had made was ‘very good’? Response: This is certainly a valid concern. Involved with this issue is the reality that God has purposes and plans about which we have little or no inkling. “For as the heavens are higher than the earth, so are My ways higher than your ways and My thoughts than your thoughts,” He declares to us in Isaiah 55:8. Furthermore, God has, and has always had, perfect foreknowledge. “For I am God, and there is no other; I am God, and there is no one like Me, declaring the end from the beginning and from ancient times things which have not been done, saying, ‘My purpose will be established, and I will accomplish all My good pleasure.’” (Isaiah 46:9-10) So the certainty of the Flood as well as its precise timing were without any doubt in God’s mind as He was in the process of creating the earth and filling it with plants and animals, with birds and fish, and with Adam and Eve. To be sure, there was no sin or death in the world that existed at the end of Day 6. I personally suspect strongly that the earth was so constructed that the processes that would eventually unleash the Flood cataclysm were not already in motion at that point in time, that is, at the end of creation Day 6. I strongly suspect (but cannot demonstrate) that it was not until Adam sinned that any preexisting mechanism was potentially set into motion. So would the inclusion of a ring of cold material in the upper mantle in the originally created earth necessarily be in conflict with a creation God could declare to be “very good”? I personally do not think so, especially if this aspect of the earth’s structure were created in a stable initial state. Therefore, an important related question is whether or not the presence of a ring of cold material in the earth’s upper mantle that was on the verge of catastrophic runaway could actually be stable for an indefinite period of time. I can imagine the answer to be yes. The mineralogical phase boundary at about 660 km depth in the earth—the boundary that separates the upper mantle from the lower mantle—provides a moderate barrier to flow crossing it. The main reason is that the main phase changes are endothermic, that is, they require energy from the surrounding environment in order to take place. So it is at least conceivable that God could have designed things such that the cold material in the upper mantle was in a mechanically and thermodynamically stable state requiring some sort of trigger, such as some radiogenic heat, to become unstable. CPT Q020 – How could the plates have accelerated to CPT velocities without ripping apart? 20. Question: How could the plates have accelerated to CPT velocities without ripping apart and without being impeded by drag from the underlying asthenosphere? Response: As I have mentioned previously in answers to earlier questions, the fact that mantle rock weakens so dramatically with increasing temperature means that the hot asthenosphere is a thousand times, or more, weaker than most lithosphere. The presence of water at levels of 100 ppm or so within the lattices of asthenospheric minerals is likely a cause for even greater asthenospheric weakness. This is true for the earth today—even without the runaway stress weakening that kicked in to allow CPT to take place during the Flood. Here I am using weakness synonymously with low viscosity. This huge contrast in strength between lithosphere and asthenosphere means that drag forces on the base of the lithosphere tend to be negligible compared to plate strength. This contrast tends to persist as runaway rapidly reduces rock strength everywhere throughout the mantle. 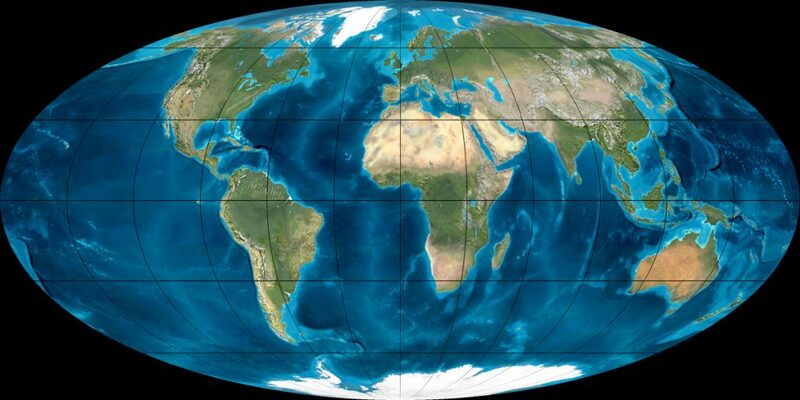 This contrast allows in today’s earth, for example, for the Pacific Plate to move in a highly coherent plate-like fashion—that is, with essentially no deformation internal to the plate—over a distance of more than 10,000 km (6000 mi). This represents the distance from where the Pacific Plate is forming via seafloor spreading at the East Pacific Rise—not that far west of the South American coast—to where it plunges into the Kurile-Japan-Izu-Bonin-Marianas trench in the western Pacific—roughly a quarter the distance around the earth. There is no indication of any failure in tension with regard to the huge Pacific Plate today as it moves at approximately 8 cm/yr relative to the no-net-rotation reference frame for the earth. Again, such motion is possible only because the asthenosphere is so extremely weak in comparison with the Pacific Plate, which leads to near perfect decoupling of the Pacific Plate with respect to the deep mantle except along its subducting boundary. What about plate failure because of sudden acceleration? Even for the sorts of peak plates speeds implied by the CPT framework, which are on the order of a few meters per second, if these are realized in as little time as an hour, the acceleration implied is only a tiny fraction of one g. For example, a change in speed of 3.6 m/s spread over an hour (3600 seconds) is only 0.001 m/s2, or 0.0001 g. The level of stress associated with such small acceleration is negligible compared with the strength of a lithospheric plate. 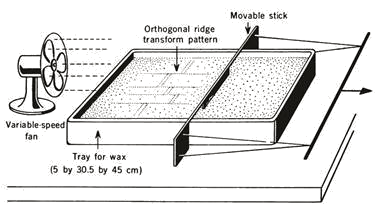 CPT Q019 – How can vertically sinking slabs give rise to horizontal motions at the earth’s surface? 19. Question: How do vertically-acting buoyancy forces, mainly from sinking slabs of lithosphere, generating what you refer to as ‘flow in the mantle’, result in horizontal motions at the earth’s surface? Response: Usually when I have used this wording I have had in view the numerical simulations of the supercontinent breakup that I have undertaken over the years. These calculations are initialized with a zone of cold material around much of the perimeter of the supercontinent to initialize motion within the spherical shell domain. This results in a large component of spherical harmonic degree two flow inside the domain. The 3D seismic tomography images below of the earth’s actual lower mantle density distribution that prominently displays this degree-two pattern. Blue corresponds to higher density, presumably cold, mantle rock, while red corresponds to low density, presumably hot, mantle rock. The type of flow characterized by downwelling mostly around a great circle, to conserve mass, leads to upwellings on either side of the circle, as suggested by the red features in the images above. 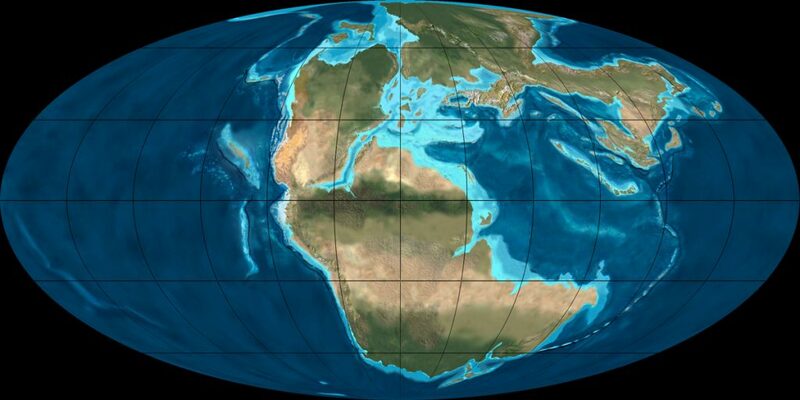 The presumed upwelling in the middle of the eastern hemisphere beneath Africa was near the center of the original supercontinent. If this interpretation is correct, then this upwelling flow would have had the tendency to cause the supercontinent to pull apart. 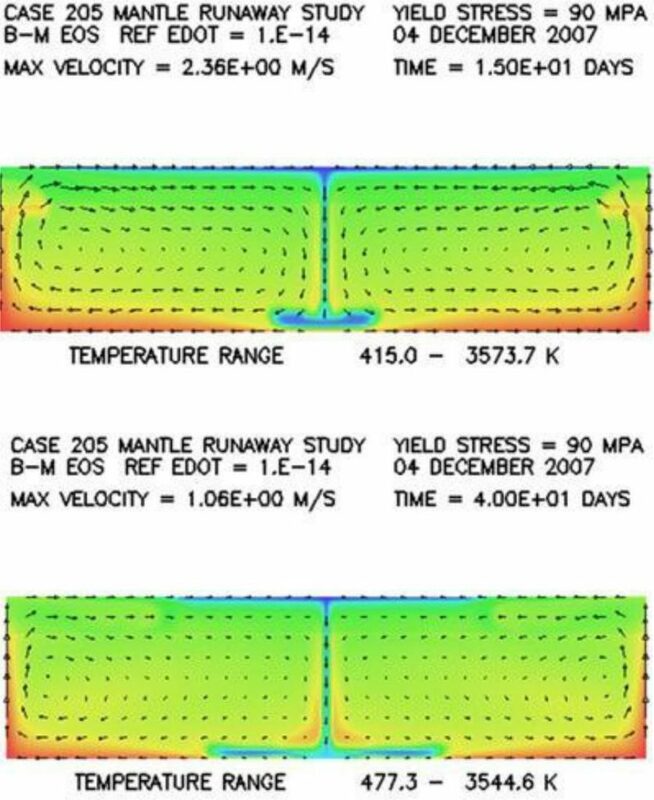 Below are some snapshots from one of the computer simulations that shows the dynamics that result from the initial temperature perturbation as conservation of mass and energy is enforced and forces are balanced everywhere throughout the domain and velocity, pressure, and temperature are recomputed at each grid point time step after time step in the calculation. Although the motions are driven solely by gravity that acts in the radial direction, there are significant horizontal forces and velocities, especially near the boundaries, that naturally arise in order to conserve mass. In summary, the downwelling flow around the perimeter of the continental region leads to upwelling flow beneath that region which results in an overall tendency to pull the supercontinent apart. CPT Q018 – How do the distinctive features of the mid-ocean ridge system form? 18. Question: What are the physical mechanisms responsible for the distinctive features we observe in the mid-ocean ridge system, specifically, the segmented ridge axis, the medial rift valley that is often present, and the transform faults that offset the ridge axis segments at close to 90° angles? Response: These features are evident in the schematic diagram below. Laboratory experiments conducted now for almost 40 years have shed some extremely important light on these questions. The experiments involve the use of molten wax to investigate on a laboratory scale the mechanics of how a medium consisting of a brittle upper layer and a ductile lower layer deforms when pulled apart. The classic paper that launched this approach is by D. W. Oldenburg and J. N. Brune, “Ridge transform fault spreading pattern in molten wax,” Science 178, 301-304, 1972. A laboratory experiment shows that ridge-ridge transform faults, inactive fracture zones, and other features characteristic of spreading oceanic ridges can be produced in a variety of paraffins. Although the resultant pattern depends upon the temperature of the wax and the ratio of spreading rate to surface cooling, the characteristic orthogonal ridge transform fault system is a preferred mode of separation. Symmetric spreading occurs under conditions of no tensile strength across the ridge, and the stability of transform faults is a consequence of their lack of shear strength. The experiment also shows that properties characteristic of oceanic ridges occur under conditions of passive convection where upwelling of material at the ridge crest is a result only of hydrostatic forces in the fluid; that is, the plate separation is caused not by large convective forces beneath the ridge but rather by tensile forces in the plate. The figure below shows the apparatus and basic results of the experiment. Caption: (Above) Experimental apparatus. A tray of melted paraffin was cooled with a variable-speed fan until a film of solidified wax formed between one end of the pan and a movable stick. The stick, representing the edge of a moving plate, was then drawn at a uniform rate through the wax by a variable speed a-c motor. 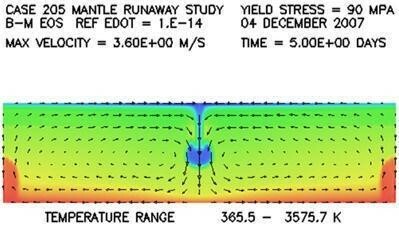 (Below, upper panel) For moderate ranges of cooling rate, spreading rate, and initial wax temperature, the characteristic segmented ridge/transform fault pattern shown in this photo developed. (Below, lower panel) Diagrammatic representation of photo, for clarity. 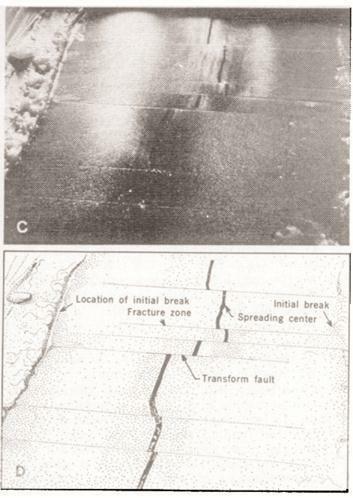 To summarize up to this point, the picture provided in this 1972 experiment with molten wax comes close to describing the essential physics responsible for symmetric spreading at ridges and for the fracture zones that offset segments of ridge at approximately 90° angles, both within the framework of uniformitarian plate tectonics (UPT) and catastrophic plate tectonics (CPT). The very weak asthenosphere reaches almost to the surface at a spreading ridge. Partial melting of asthenospheric rock generates the basaltic magma that fills the gap as the oceanic plates diverge along the ridge axis. The circulation of sea water within this hot rock cools it rapidly and causes a strong and brittle surface layer to develop away from the ridge axis. However, the slip along the active portion of the transform faults keeps these active faults weak. Hence, there does seem to be a solid correspondence between the crucial aspects of the molten wax experiment and the mid-ocean ridge/transform fault environment. CPT Q017 – Is it true that ancient trenches have never been found? 17. Question: Have ancient trenches ever been found? Response: The Franciscan terrane in California, as was mentioned in my response to question 4 above, is a classic example of a fossil subduction zone complex that has been in the geology literature for the past 40 years. With only a short drive north of San Francisco, one can inspect these rocks first hand. Similar fossil subduction zones containing high grade metamorphic blueschist rocks have been described in Greece, Turkey, Japan, New Zealand, and New Caledonia east of Australia. Another such example mentioned in my response to question 5 above is the North Motagua Fault Zone in Guatemala. There are dozens of other spectacular examples well documented in the standard literature. CPT Q016 – How can a trench possibly intersect a ridge? 16. Question: Why is it that at three locations on earth, a trench (where rock presumably is descending) purportedly intersects a ridge (where material is presumably rising)? How can material be going up and down at the same time? Response: The first of these sites is the north end of Explorer Ridge, located off the coast of British Columbia just south of Queen Charlotte Island and northwest of Vancouver Island, where it forms a triple junction with the Queen Charlotte Fault and the north end of the Cascadia Trench. The location is indicated in the figure below by the black arrow. 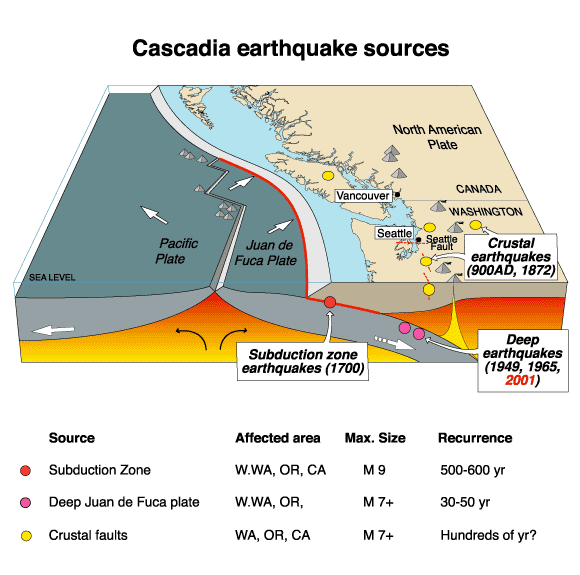 As far as can be determined from observation, both the Explorer Ridge and the Cascadia Trench terminate at this triple junction. There is nothing which seems to indicate that the ridge continues toward the continent beyond the trench. New plate produced by spreading at the end of the ridge appears to be accommodated by oblique subduction into the trench. So this site does not appear to correspond to a case of a ridge itself subducting into a trench. The second site, at 20.5 °N, 107 °W, is near the northern end of the East Pacific Rise along the western coast of Mexico just below the mouth of the Gulf of California. The region is shown in the map below [ed. p. 21,933]. Caption: Neotectonics of Rivera Plate region (from C. DeMets and S. Stein, “Present-day kinematics of the Rivera Plate and implications for tectonics in southwestern Mexico,” J. Geophys. Res. 25, 21931-21948, 1990) [ed. : online version might be accessible here]. 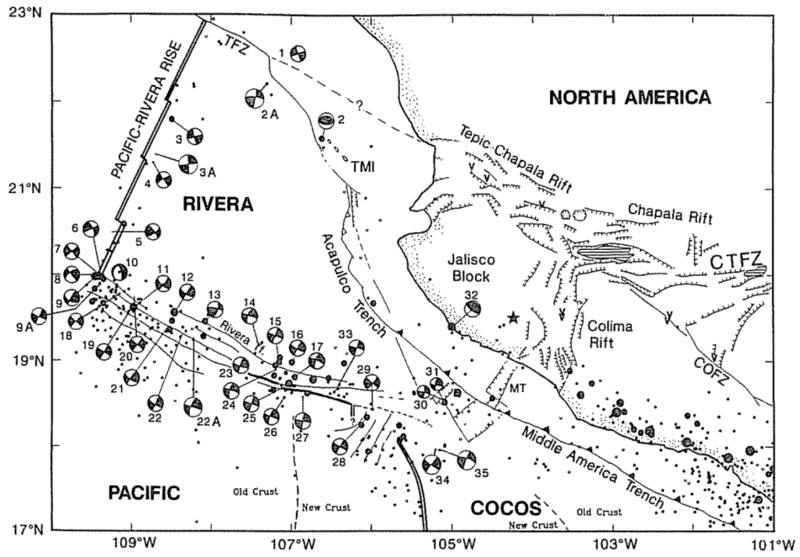 One notes that the location 20.5 °N, 107 °W is in the middle of the small Rivera Plate and not on a ridge, although it is near the Acapulco Trench. So it is not clear what feature was intended here. The third site is along the western coast of southern Chile, where the Chile Rise, an oceanic ridge between the Nazca and Antarctic Plates, is indeed being subducted into the Peru-Chile Trench. A PowerPoint geology class presentation of this remarkable feature is available here. Below are some of these slides. Why is it possible for this portion of the Chile Rise to subduct? The main reason is that the plates on either side of the ridge, the Antarctic Plate and The Nazca Plate, are sufficiently strong to carry this ridge segment along as they move into the trench. What happens to the rock in the ridge as it migrates into the subduction zone? To the extent that the Antarctic and Nazca Plates continue to diverge from each other, which their strength away from the ridge would cause them to tend to do, there will be flow of warm rock from below to fill the resulting gap. But this flow is relative to the movement of the gap into the trench and beneath the South American Plate. So whether the net motion is actually upward or downward depends on which of the two vertical components of motion is greater. This conclusion is the same for both UPT and CPT.